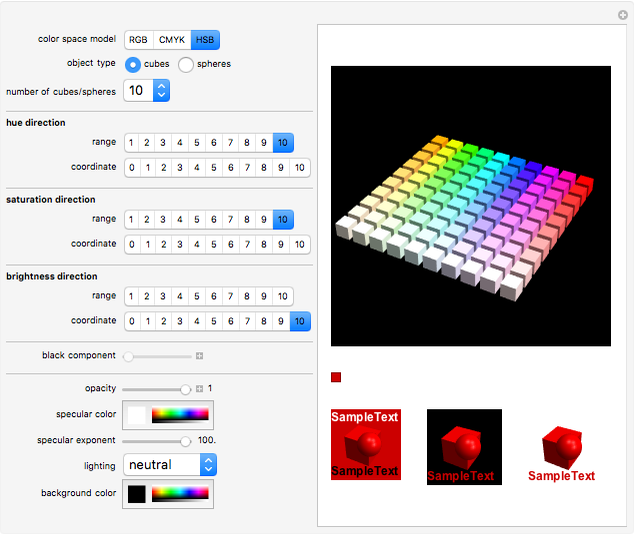 Mathematica lets you specify and use colors from three different color space models: RGB, CMYK, or HSB. However, finding just the color you need is not always easy, especially when a colored background or the cross effects with additional styling options need to be considered. 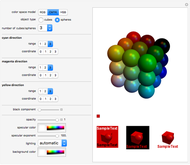 This Demonstration lets you explore these three color space models and a few of Mathematica's graphics options. 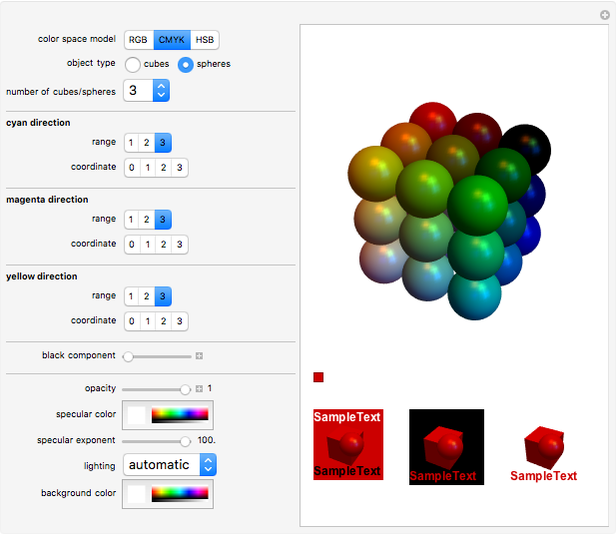 This should make it useful not only for your own work with Mathematica, but also for many other color-related questions. Select a part of color space that you would like to see, and choose between a representation of the colors on cubes or spheres to see the affect of the colors on flat and curved surfaces. Specify options such as opacity, lighting, and specularity as well as the background color. 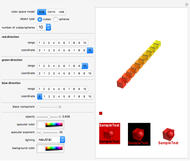 Click one of the cubes or spheres to display its color code and adjust the items in the bottom row, rendered in the color and settings you chose. Use the "coordinate" buttons to display only colors with a certain value for one of the directions and the "range" buttons for all colors up to this value. You can rotate the plot using the mouse, but you need to click an empty part of the plot area because all spheres or cubes are buttons. If graphics are slow on your computer, try to keep opacity at 100%, especially when displaying larger portions of color space.